The Porcine Trace Real-time PCR Kit is designed to detect the specific gene for porcine species in food. This kit provides real-time PCR Master Mix with enzyme components and the specific primer/probe set for rapid testing by real-time PCR assay. This kit provides a method for detecting Sus scrofa (pig) DNA that may be present in a food sample. The principle is based on the PCR amplification of a unique species specific tag present in the mitochondrial genome of that species. The mitochondrial gene is the ideal target since it has been sequenced for many different species. Comprehensive bioinformatics analysis followed by careful primer design ensures the detection of all strains whilst excluding detection of other closely related species. Furthermore, the multiple copy of each mitochondrial genome within each cell enables the detection to be 100 times more sensitive than tests which targets single gene in the nuclear genome. 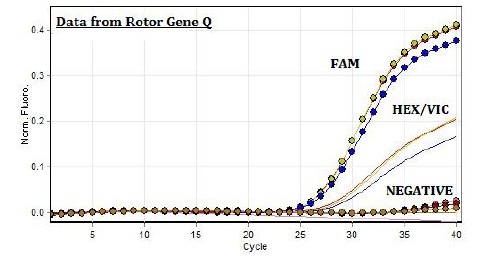 Besides, the short amplicon size (~100bps) overcomes the DNA degradation problem in highly processed food, thus decreases the probability of false negatives.PCR amplification is detected by means of a double dye probe (Taqman® probe) which is degraded during PCR, releasing fluorescence. The fluorescence signal can be used to both detect and quantify the number of copies of porcine DNA present in the sample. The kit provides species specific primers and probe that detect the species of interest. The primers and probe are read through the FAM channel and detect the presence of the mitochondrial DNA belonging to Sus scrofa. As internal control, mitochondrial DNA for vertebrate are read through VIC channel. The kit is validated for use on Rotor Gene Q, ABI7300 (with additional High Rox), Biorad CFX96, Roche Lightcycler, Biometra TOptical Thermacyler. The kit contains a Sus scrofa DNA positive control sample for the PCR set up. This DNA is used to generate Ct values for both the species-specific and the universal component of the speciation test. The difference between these two values provides an accurate representation of a 100% Sus scrofa sample. Each time the kit is used, at least one positive control reaction must be included in the run. This positive sample demonstrates that both sets of primers and probe are detecting the species of interest. If no amplification is observed for the positive control, the test results are invalid and must be repeated. Care should be taken to ensure that the positive control does not contaminate any other kit component which would lead to false-positive results. This can be achieved by handling this component in a Post PCR environment. Care should also be taken to avoid cross-contamination of other samples when adding the positive control to the run. This can be avoided by sealing all other samples and negative controls before pipetting the positive control into the positive control well. To validate any positive findings a negative control reaction should be included every time the kit is used. For this reaction the RNAse/DNAse free water should be used instead of template. A negative result indicates that the reagents have not become contaminated while setting up the run. One of the functions of the universal meat signal is to serve as an endogenous control, confirming the extraction of a valid biological template. An early universal meat signal indicates the presence of a good yield of animal material. A poor signal indicates that there is an insufficient amount of animal material to perform an accurate speciation test. Store all reagents at -20°C. Stable up to the expiry date stated. 1 + + + – The porcine specific gene is detected in a sample. 2 – + + – The porcine specific gene is NOT detected in a sample.